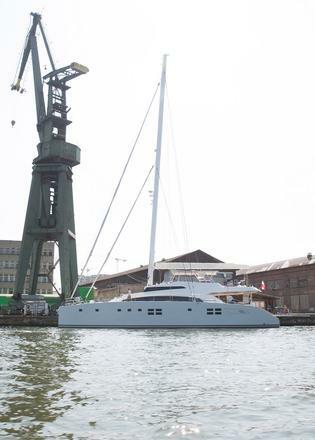 The first hull in the Sunreef 88 range of double deck sailing catamarans has been launched in Gdansk for a European owner, the Polish yard has announced. This fully personalised multihull superyacht measures 26.82 metres LOA and was styled inside and out by the in-house team at Sunreef Yachts. 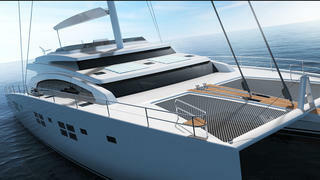 In a statement, the Polish yard added that the design of the Sunreef 88 is “a great display of the shipyard’s non-conformist attitude and a genuine example of an avant-garde sailing catamaran concept”. Captain Ian Sellers added: "She is a beautifully crafted, fully customised transoceanic catamaran, with superb quality and finish." The design brief was focussed on three key themes: luxury, performance and privacy. To this end, the Sunreef 88 features more than 300 square metres of living space — an impressive figure for a yacht of this size, proving that bigger isn't always better. 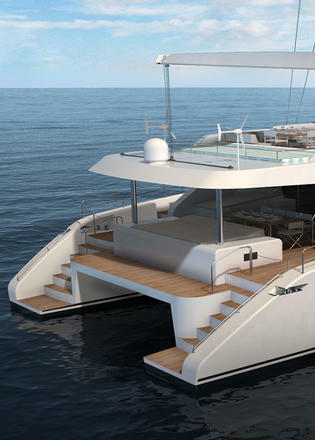 This two-deck sailing yacht will feature an extensive flybridge with a central helm station and plenty of al fresco dining and relaxation spaces. 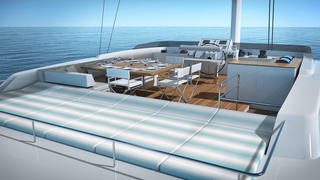 Back aft, the cockpit features a central dining table with seating space for ten guests as well as a second sunbed, making good use of the Sunreef 88's 11.2 metre beam. 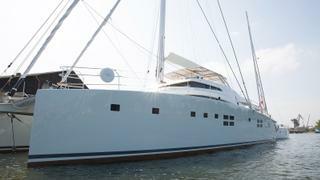 The in-house design includes sporty and dynamic exterior lines, as well as a fully customised interior layout. Key features include a mezzanine level in the saloon and a main-deck owner's cabin, which boasts superb views out to sea through panoramic windows. Auxiliary power comes from a pair of 425hp engines drawing on a total fuel capacity of 8,000 litres, while her total sailplan is in excess of 345 square metres. Sunreef added that the designers drew inspiration for this single-masted sailing yacht from the 35 metre flagship yacht Che, which was launched in 2010. 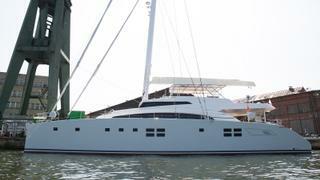 The Sunreef 88 is the sixth superyacht from the Polish yard, which has also created the Sunreef 102 yacht Ipharra.